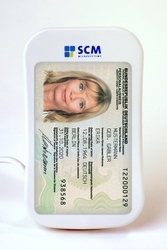 SCM Microsystems announced the availability of the CHIPDRIVE IT Security Kit, a contactless smart card reader and software designed to protects personal data online when used with the new German electronic ID cards. Beginning in November, the German government will start issuing a new electronic ID card based on contactless smart card technology to all citizens. The ID card includes an electronic proof of identity feature that safeguards the user’s personal data when transferring information over the Internet, such as when making online purchases, downloading music, confirming age or place of birth, filing an insurance claim, or communicating with local or federal authorities and administrations. To use the e-ID feature online, a smart card reader is required. Using the reader and the e-ID feature together significantly increases online trust and security compared with simply typing a user name and password, which is still the most widespread but easily attackable security method used for online transactions. The CHIPDRIVE IT Security Kit includes a smart card reader for contactless smart cards certified by the German Federal Office for Information Security, a government-provided eID interface application (AusweisApp), and a 12-month license for the popular AVIRA Antivirus and Firewall software, AntiVir Premium. The new CHIPDRIVE IT Security Kit includes a USB contactless smart card reader that can be used with the German ID card as well as with cards for transport applications and other payment systems. Internal flash memory enables secure firmware updates in the field. With the CHIPDRIVE IT Security Kit, SCM Microsystems addresses the need for German citizens to have cost-effective access to the new eID capability of the German ID card. The CHIPDRIVE IT Security Kit is immediately available and retails for around $35.